Trekkies have a special fondness for the Gorn, but here's a few facts for the less-familiar: the Gorn are giant space lizards. They appeared rarely in the TV shows, but the race's debut in the 1967 Original Series episode "Arena" went down in history as one of the most awkward man-vs-man-in-a-monster-suit fights ever televised . 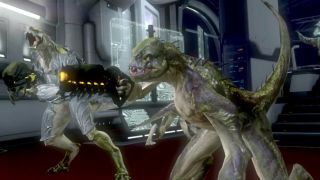 They're now a major enemy in the video game counterpart of JJ Abrams' upcoming Star Trek: Into Darkness film, and developer Digital Extremes wants the wrathful reptilians to pose a considerable threat beyond their wonderful fashion sense. Several Gorn variations will shoot, snarl, and leap at Kirk and Spock, including giant smashy Gorn, sneaky invisible Gorn, and female Gorn of striking hues. Their agility probably serves to boot players out of cover and keep the action moving, but knowing Kirk, all it might take is one dramatically slow judo-chop to the neck to drop one of these things. Star Trek energizes on April 23 in the US and April 26 in Europe. Into Darkness is in theaters shortly thereafter on May 17.